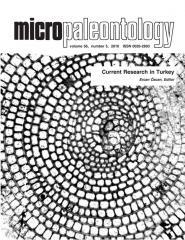 ABSTRACT: Larger foraminifera of the Tertiary a1 (Thanetian) to Tertiary b (Priabonian) of the Far Eastern Letter Stages are recognized in the upper Paleocene to upper Eocene limestones of Jaintia Hills, Meghalaya. The occurrence of Pellatispira preceded both occurrences of Lepidocyclina spp. and Nummulites fabianii. Three new genera and species, Meghalayana indica, n. gen., n. sp., Raoia indica, n. gen., n. sp., and Protogypsina indica, n. gen., n. sp. are described after Orbitosiphon tibetica, Paleocene orbitoidal foraminifera as a group with Orbitosiphon.